November is a month for giving thanks…and after a long growing season and successful harvest, our family has many people to thank. We are always grateful to the folks who work hard throughout the year: from the crew in the fields to the winemakers in the cellar, to the sales crew who works with our valued distributor partners, and everyone in between. It takes lots of teamwork to get our wines all the way to your table, to enjoy with family and friends. Thanks to YOU, for making our passion and hard work a part of your life. Kristen Bruce was a month away from graduating college and getting ready to start her career. 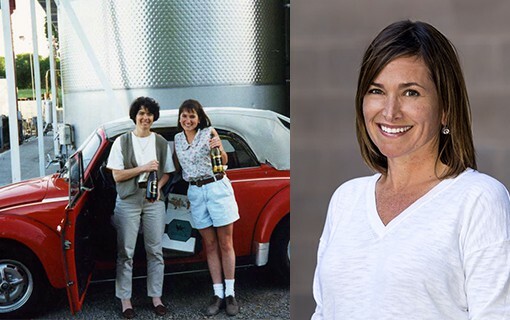 A large online database of wine jobs did not exist back in 1993, so Kristen had to get creative to break into the industry. From the moment she took her first steps at the Clarksburg winery, Kristen knew this wasn’t going to be your typical interview. “It was Friday, and Chris Bogle was about to start the weekly ‘production meeting,’ which consisted of the handful employees discussing business over a beer. As I’m walking up to meet everyone, Chris hands me a Budweiser. As a 23-year-old fresh out of college, I thought this was the coolest place ever,” Kristen remembers. Kristen was hired on the spot and would start a week after graduating from Cal Poly, San Luis Obispo, at first splitting her time as a lab technician and assisting Patty with administrative duties. Very quickly it became clear Kristen was meant to work sales for the company, but she still spent the majority of her time working closely with Patty in those early years. The pair would become very close, with Patty even treating Kristen as her third daughter. In return, Kristen was not afraid to encourage Patty when it came to certain business decisions. Even with limited web building skills, Kristen and Mike pulled it off and the Bogle website was born. The couple would marry a short time later and now live in Land Park raising their two boys, Ryan and Nick. Kristen currently serves as a Key Accounts Specialist working with various boutique grocery store chains that offer Bogle wines. The photos above show Kristen (at right) with Patty Bogle in 1994, and Kristen today. 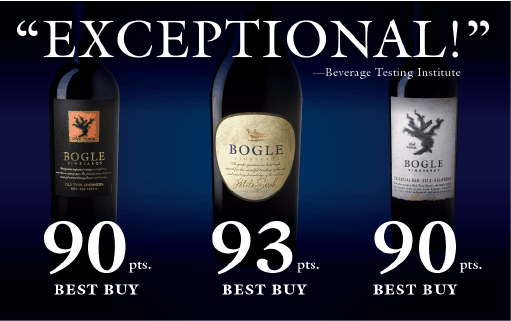 BEVERAGE TESTING INSTITUTE Bogle Wines Score Big! While we are pretty fond of our wines, and we know so many of you out there enjoy them as much as we do, it is always amazing to receive great scores from wine reviewers! The Beverage Testing Institute has been tasting and rating wines since 1981, when they were founded with the intent of providing fair and impartial wine reviews for consumers. They also provide all their review on a free website, tastings.com. Five of our wines have earned top marks recently…read on to check it out! Black garnet color. Bold, fruity, savory jammy aromas of black raspberry, leather, vanilla and cherry compote with a tangy, dry medium-to-full body and a warming, complex, medium-long finish with well-integrated tannins and moderate oak. This vibrant petite sirah over-delivers with layers of fruit and complexity, silky tannins, and a chewy, satisfying texture. Deep purple color. Delicate, interesting, toasty butter aromas of roasted nuts, berry pie crust and brown butter with a supple, tangy, dryish medium body and an appealing, medium-length blood orange, apple skin, baking spices, and cedar finish with dusty tannins. A wonderfully balanced, elegant and layered red blend. Bright clear light-medium golden color. Delicate, toasty, fruity aromas of nougat, pineapple cake and candied lemon peel with soft, vibrant, dry-yet-fruity medium to full body and a tingling, refreshing, medium length pineapple, apple sauce and brazil nuts finish with fruit tannins and light oak. A juicy mouthwatering chardonnay that will cover a lot of bases. Black garnet color. Bright, buttery aromas of toffee, berry tart, mocha, and herbs with a supple, bright, dry-yet-fruity medium body and a silky, interesting, crisp eucalyptus honey, almond nougat, and cedar finish with light oak. A smooth, spicy red blend that is sure to please. Ruby color. Aromas of German chocolate cake, dried berries, and candle wax with a soft, bright, dry-yet-fruity medium body and a tingling, appealing, medium length berry chiffon, toffee, and lemon spritzed apple finish with well-integrated, fine tannins and light oak. A robust and very well-balanced zinfandel. Throughout the year, there are amazing non-profit organizations working hard in our local communities. The holidays are an especially important time as so many families struggle to put meals on the table. It is all too easy to get caught up in the “busy” and forget that we can also contribute to those families in need. 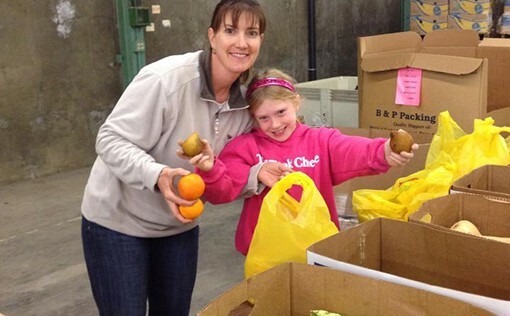 There are many local community programs across the country that support families in need. Please consider how you might be able to contribute this year.